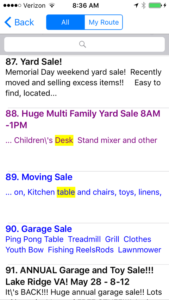 Yard Sale Treasure Map provides a number of ways to search for keywords in the yard sale craigslist ads. The easiest way to find something specific is to use the search field at the top of the list view. Simply type in a keyword and select Done. The list is filtered to show only the sales that match the keyword. 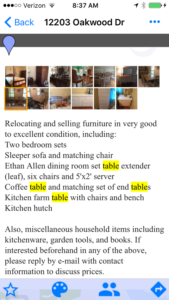 The keyword is highlighted in the list view as well as the craigslist ad. To restore the list view back to showing all sales remove the keyword by selecting the x on the right side of the search box. Keyword Colors is a useful feature available to subscribers. This feature, available in the Settings menu, lets you set up a list of keywords that you want the app to always be on the look out for. 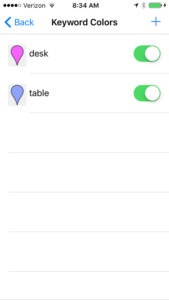 Matched sales will automatically turn to the selected color on the map and in the list. 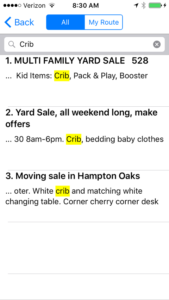 Similar to keyword searching described earlier, any keyword matches are automatically highlighted in the list view and in the craigslist ad to help you identify the item you are looking for. 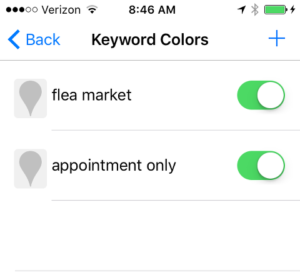 Keywords can be temporarily disabled using the toggle switch. 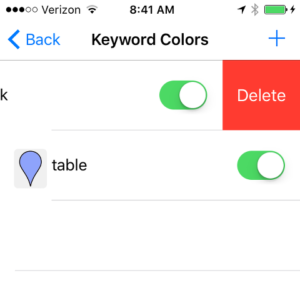 Keyword Colors can be deleted in iOS by swiping the entry to the left and in Android by long pressing the entry. Keyword Colors can also be used to hide sales you are not interested in. For instance, if a certain yard sale is posted every week that you know you are not interested in you can set the keyword to be the address of the sale and the color to be “hidden”. Each week the sale will automatically “appear” hidden.